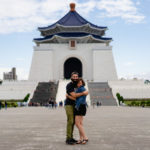 The Cooperatize Team recently went remote – and since we are in the business of travel, spread ourselves across the world and visited places from the Americas through to Asia. So we decided to provide you with the best of our experiences in our new Cooperatize Around the Globe section. The Tokyo Metro stops running at midnight (or 1am depending on the train line) and picks back up at between 4-5am. If you miss that last train, it could cost you a fortune to get to where you are staying or need to go. Some of the locals told me of a few tips to save money. Capsule Hotel: These show up in meta search as a private room, which is kind of true, you are able to get a coffin-rlike sleeping quarter that locks, has light and electric, and some have televisions in them. You also get a locker and a shared shower and toilet. These range anywhere from $15-$30 a night. Internet Café: The Internet café gives you a private room or cubicle as low as 200 yen per hour. 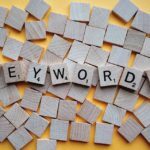 You can waste the night away surfing the internet (like reading this story) or as some locals tell me they simply pass out in the cube until it’s time to go to work or catch the train. Rental Cars: Yes, a rental car. There are now some car sharing services that primarily cater to the Japanese, but I’ve heard that because of the pricing, it works out to sleep in the car. There is a base fee where 6 hours is 5250 yen (about 47 USD) plus a mileage fee of 15 yen per KM. But since you aren’t driving anywhere you just pay the base fee! 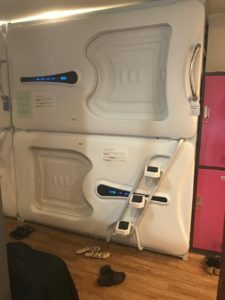 Capsule Hotel – It wasn’t as uncomfortable as I thought it would be. The location was great. The accommodations were OK. And the price was unbeatable. I did not like the shared bathroom, which was annoying because you had to get completely dressed and make sure that you didn’t lock yourself out of the capsule every time you got up. Other than that, I did feel like I was in a coffin but if you’re traveling solo and aren’t claustrophobic, it could be a nice, inexpensive option. They did have free Wi-Fi and offered shampoo, towels, and soap. For more about the Capsule hotel experience, click here. Hotels: 3-star – I tried two different three-star hotels in Tokyo, the first was the Ginza Hotel in Ginza, the second was the Henn Na Hotel in Ginza which was right next door. Both offered relatively inexpensive rooms at $50-75 per night on average with Saturday night being the most expensive at $100-125. Vending machines, coin-operated laundry, cleaning service, pajamas and slippers, free WiFi, towels, soap, shampoo, toothbrush, and razor. While in Western Japan, I tried the APA Hotel. The one in Hiroshima also offers access to their Onsen (public bath). Both the APA Hotels (in Kyoto and Hiroshima) were right outside of the train station, which was perfect for limiting the amount of schlepping you had to do. 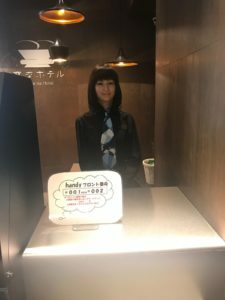 Back in Tokyo, the Henn Na (which translates to “weird”) Hotel had an additional feature: robot staff. 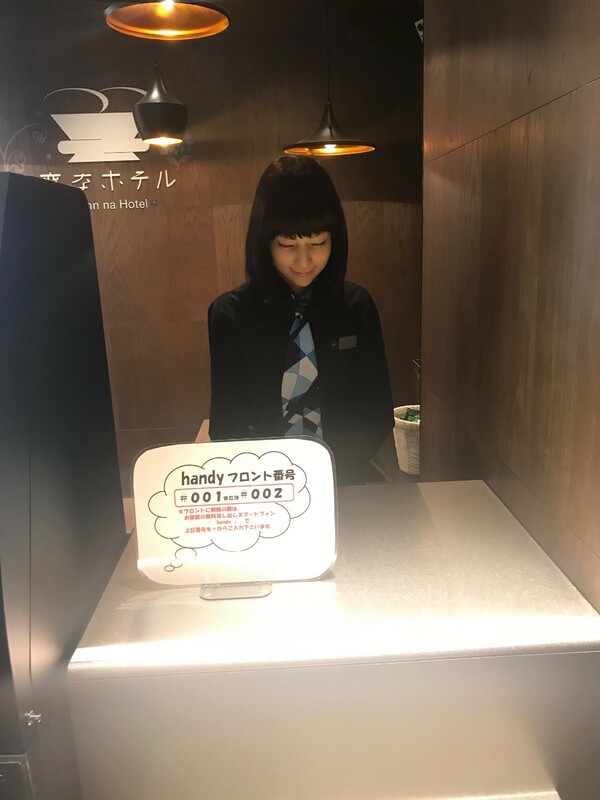 Yes, the front desk had robots to help you with checkout, but Westworld fans need not be alarmed, really it was a kiosk that you read to check out and to make your key upon check in. The robots were just a humanization of what was on screen. All three offered similar amenities and services. In my opinion this was the best option for what you received for the price. Hotel: 5-Star 7(Westin) – The Westin is great. 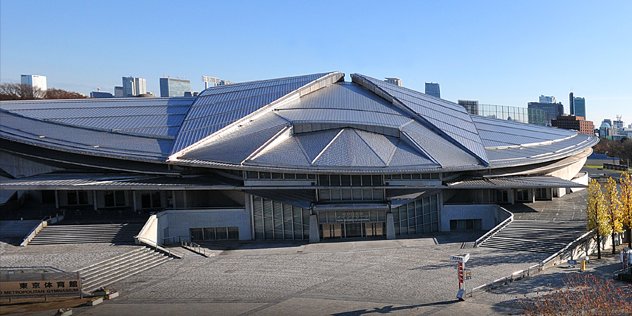 Its location in Tokyo is not the most convenient as you are still about a 7-10 minute walk from the Ebisu train station. Everything you would expect in a 5-star hotel from gym (you do need “indoor” shoes, see section on working out), great restaurants in the venue, newspaper, and mini bar, but unfortunately not more than that. Every building is a mixed-use mall, especially in and around train stations. Everything is inside the mall from retail to restaurants to attractions so make sure you check them all out. And who said retail was dead? Family Mart, Lawson’s, Seven Eleven: These are your basic 24-hour convenience store and there normally at least one of these on every corner if not more; they accept credit card (I’ve charged as little as 100 yen); you can also get fresh food here if need be. Doutor, Excelsior Caffe, Tully’s Coffee, Caffe Veloce, St Marc’s Café, Starbucks: Here are your chain coffee shops which also offer baked goods, smoking sections, and breakfasts. Daiso, 3 Coins: Daiso is essentially the dollar store (108 yen with tax), and 3 coins is the $3 store or 300 yen (3 100 yen coins) store. You’ll be surprised what 100 yen gets you nowadays. 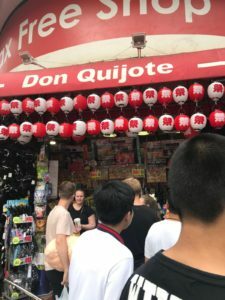 Don Quixote: This is a variety store that sells everything. Not the greatest prices, but easy to shop and with some locations being open 24 hours you can get what you want when it’s easiest for you. 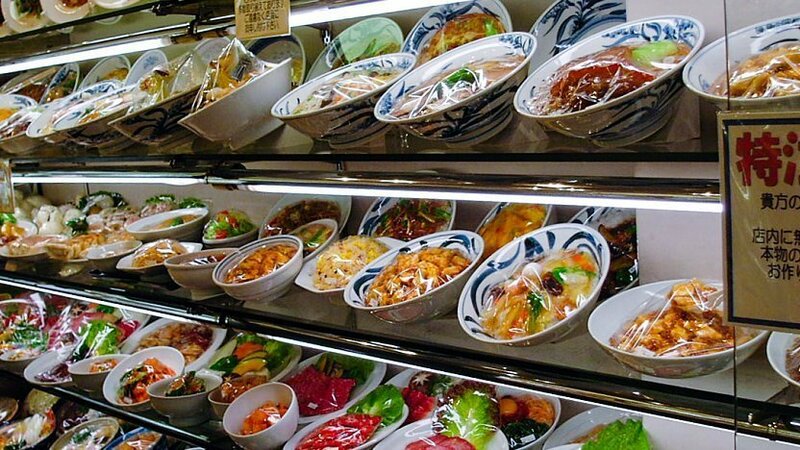 Kappabashi Street Stores: Every restaurant has models of the food, allowing you to order by pointing and grunting, with the food eerily looking exactly like the model. In Kappabashi (walking distance from Ueno) you are able to buy anything related to food, kitchens, and restaurants including fake food. And if you fall in love with fake food, they even offer classes on how to make your own. Character Street in Tokyo Station: Japanese stories and its characters have become globally known and recognized. Head down under the main train station and grab some great character memorabilia from here from Pokémon to Hello Kitty to Gundam to Rilakkuma. There are a number of places that you can park, plug in, and hop on the WiFi (if you didn’t get Pocket WiFi (see Part 1). 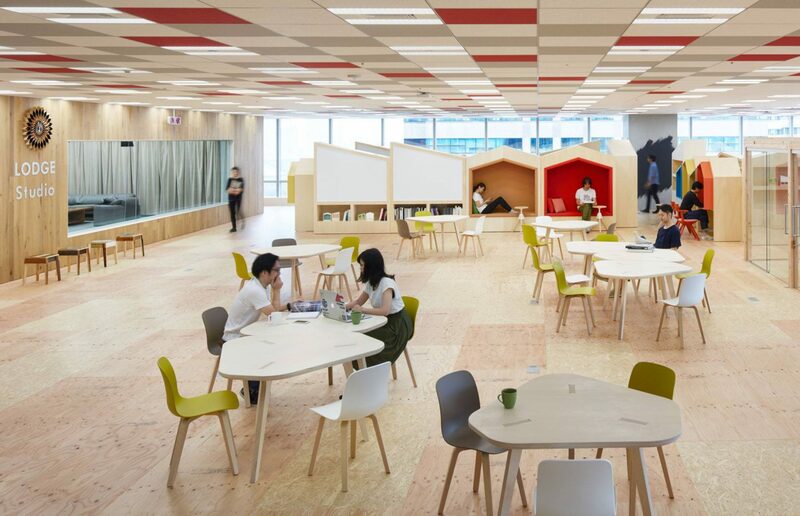 Some of these spaces are as low as 100 yen an hour and offer coffee, power, currency exchange, and a more serious environment than the aforementioned coffee shops. If you are looking to also talk technology, stop by the Yahoo Lodge for some free co-working sponsored by Yahoo. If you aren’t staying at a four or five star hotel like the Westin, you won’t have a gym. There are tons of people on the street jogging; many run the loop around the imperial palace. However, if you want to lift weights, you’ll need to find a gym and look for what is called the training room. I visited three different gyms. With all of them, the cost is simply to walk through the door. 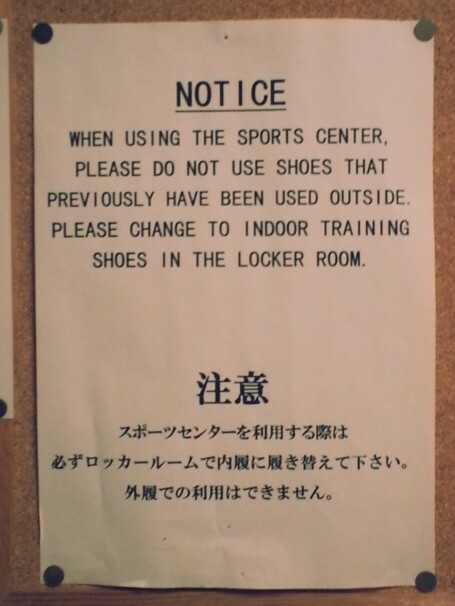 You also need a pair of “indoor” shoes and if you want to shower, a towel. All of these are rentable. Make sure you follow the rules for the shoes though. If you want to use a popular piece of equipment like a bench press, smith machine, or squat rack, you have to sign it out. There’s a white board there that lets you put the time that you started and the time that you are finished (typically 30 minutes for one, and 45 minutes for pairs). Also a small hand towel is provided at each station so make sure you wipe down the machine after you use it. The Tokyo Metropolitan was the best gym but unfortunately it was closed down for Olympic preparations the second time I wanted to use it. On top of two training rooms, they offer a massage chair for post-workout. That’s it for Part 2! 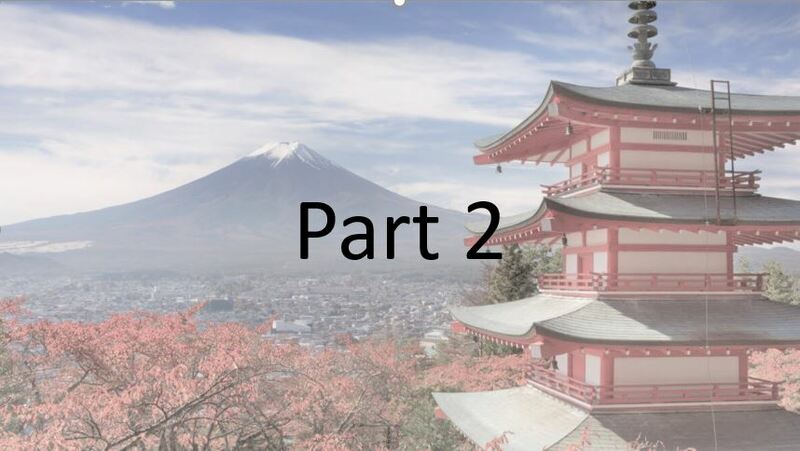 Stay tuned for Part 3 for info about attractions and things to do throughout Japan.